BB-11 has moved due West towards Jharkhand and weakened to 1002 mb. The UAC associated with it is towards the SW, and corresponding precipitation in the W/SW of UAC region in East MP, Jharkhand, Chattisgarh and East Vidharbh. Parts of South Bengal and Orissa got good rainfall. Even our "spot" city forecast on Hardoi was good with 70 mms, Bareilly 12 mms.. Other nearby places got :Domeriaganj 124, Bansi CWC 118. As the system moves West, the trough along the East coast shifts a bit and slants NW/SE. Precipitation increases in Vidarbha and MP. Rains increase in interior TN today, and Chennai gets Thunder showers by tomorrow as predicted. UAC has descended as a sea level Low , BB-11, and as on Tuesday evening is centred over Southern Bengal. Associated UAC still hovers in the Orissa area. The axis lies in the Himalayan foothills, and further the axis runs East towards another low off Vietnam coast. As forecasted for Tuesday (see vagaries Tuesday Forecast Map), NW regions of UP, Bareilly, Shahbad and Hardoi circles getting rain as seen in the Wundermap of tuesday evening (below) of Tuesday evening. Kolkata recieved 22 mms on Tuesday morning till 11.30 am IST. Northern UP and coastal Bengal and Orissa are receiving heavy rains, with Haldia and Balasore getting 70 mms, Allahabad and Diamond Harbour seeing 40 mms, getting ..and in adjoining Southern Nepal, Dhangadi saw 146 mms, Dadeldhura 100 mms, Birendranagar 72 mms and Nepalgunj 13 mms. Rain figures till 5.30 pm IST. and, i fear some flooding in UP with the rain falling and UAC persisting.. The Monsoon Axis is pushed itself into the Himalayan Foothills, and runs thru UP and the Bay UAC into the Bay waters.Western End of axis at 998 mb, but weakening to 1000 mb and shifting South (through enlarging in area) by Wednesday..
As anticipated, a UAC has embedded itself in the axis over UP. Resultant clouding in UP is seen. Vagaries forecast (Sunday blog) mentions of rains from this UAC in Central UP and adjoining Nepal for Tuesday. Hoping for Kolkata and Central UP rains today..
UAC moves West from Myanmar Coast , and is Located in th North Bay South of the Ganges Delta region. 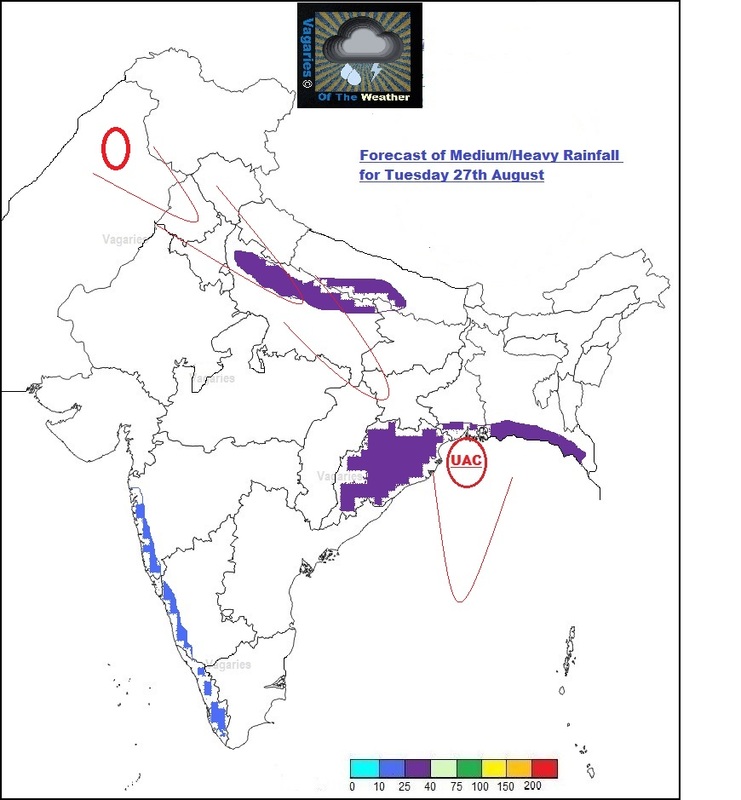 The embedded UAC in the monsoon axis has formed in Eastern UP region, and the precipitation expected in the above region in Vagaries Tuesday Forecast Map, may occur as shown. Region and city specific mentioned yesterday. Absolute moderate to light rains in Mah today (Monday)...till 5.30 pm...In ghats Mshwar got 17 mms and Bhira 13 mms,, and then not much...Scruz 4 mms, Colaba 3 mms, vagaries 3 mms, Solopur 3 ,mms, Pune 0.1 mms. BB-10 has become an UAC over the MP/Gujarat border. Its clouding has "bloated'' And spread out over a larger area over North Mah and adjoining MP and Gujarat. But, precipitation is low, hence not much was expected from this. Repeat Post:"Storm "Trami" in the Pacific is now at 970 hpa strength, and just North of Taiwan. It has produced a strong trough in a SW direction, and has an embedded Low "pulse" at 998 mb and 107E and 20N, off Northern Vietnam Coast.. Keeping a track on this as it moves Westwards along the axis." Yes, and move Westwards it did ! The pulse has entered the Bay, and on Sunday evening positoned off the Myanmar coast at 20N as an UAC at 700 hpa. Monday 26th, we can track the UAC to strengthen, and cover a larger region in the Nort/West Bay. Normally, the rainfall associated with this UAC will be restricted to the Sea areas on Monday. 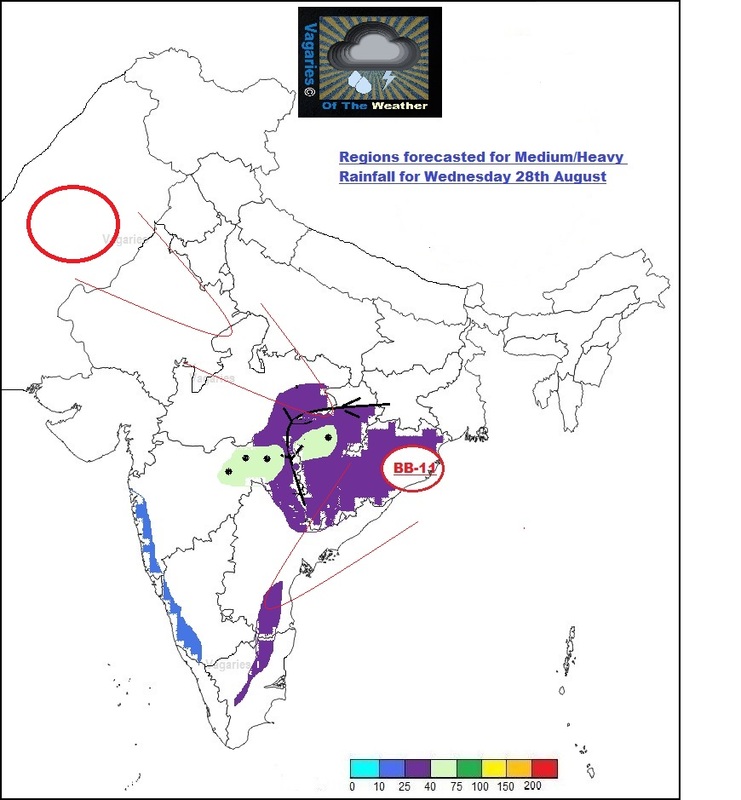 Showers in East Vidarbh and Chattisgarh possible on Monday night. Tuesday 27th, the system descends, and at 850 hpa, would be centred off the Orissa coast. Clouding due to the system would cover coastal regions of Orissa and W.Bengal. 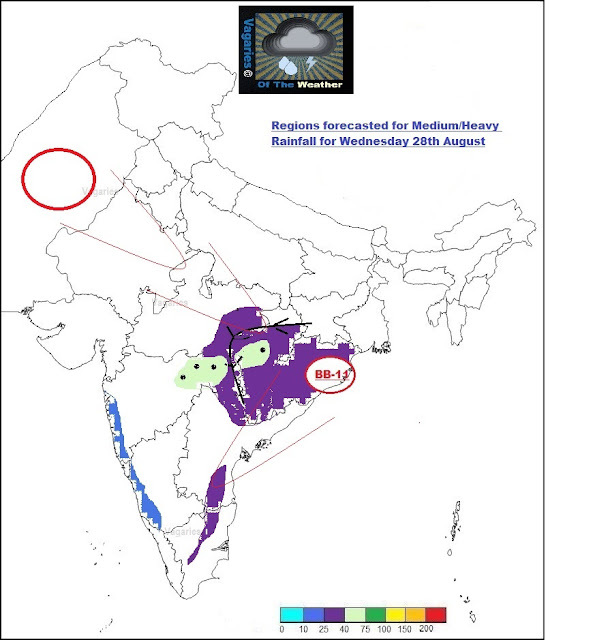 Precipitation likely in all districts of Orissa. Some heavy falls extend into Nepal, and Kathmandu can get thunder showers on Tuesday evening/night. Some stray extension into NW Uttar Pradesh possible with showers in the Shahbad, Hardoi and Bareilly cicle. Meerut and othe Northern regions of UP can get showers also. Wednesday 28th: System may descend, and form a low at sea level (BB-11). The precipitation from the system may be concentrated in the W and SW quadrants, as the isobars in that quadrant will be spaced closely, and get bring windy conditions . Heavy rainfall is likely in Chattisgarh, and adjoining Vidarbh. Heavy falls likely in Districts of Nagpur, Wardha, Amravati and Gondia. In Chattisgarh, Raipur region can get heavy rainfall. City to watch for heavy rainfall: Gondia and Raipur. Local Thunderstorms occur in interior TN. Thursday 29th: System moves West/North-West and lingers over the MP area. Overnight rainfall mentioned for Wednesday, spills over into Thursday also. A rain patch may bring showers on the East coast from Vijaywada to Chennai in the South. South West Monsoon Possibily Withdraws from Western Pakistan by Thursday 29th. 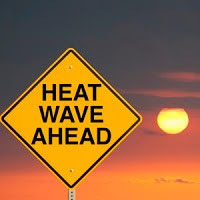 Balochistan and Parts of Interior Sindh remain hot at 43/44c. Karachi may expect an odd day of light drizzles till Thursday. Friday 30th: As the system weakens, and moves west. 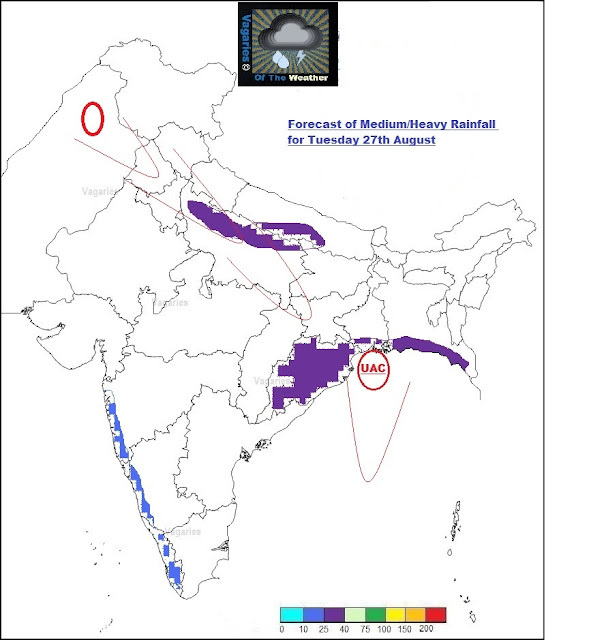 The heavy rainfall likely in the South MP and North Mah. region (Between Seoni and Jalgoan regions).,,details later. Mumbai: Monday thru Thursday: Partly cloudy. Subdued rainfall with 2/3 passing showers, that too in some parts. Daily rainfall 7-10 mms. Warming up to 30/31c. Delhi NCR: Partly cloudy. Thunder Showers likely in region on Tuesday. Otherwise some localised rain in scaterred areas. Chennai: Partly cloudy to suny. Can expect thunder shower on Thursday. Otherwise warm at 35/36c. Pune: Nothing to cheer , with Cloudy and no meaningful rains till Thursday. Around 3-5 mm/day. Surat too will have very little rainfall till Thursday. For after Thursday, we see the system strength in the next few days. 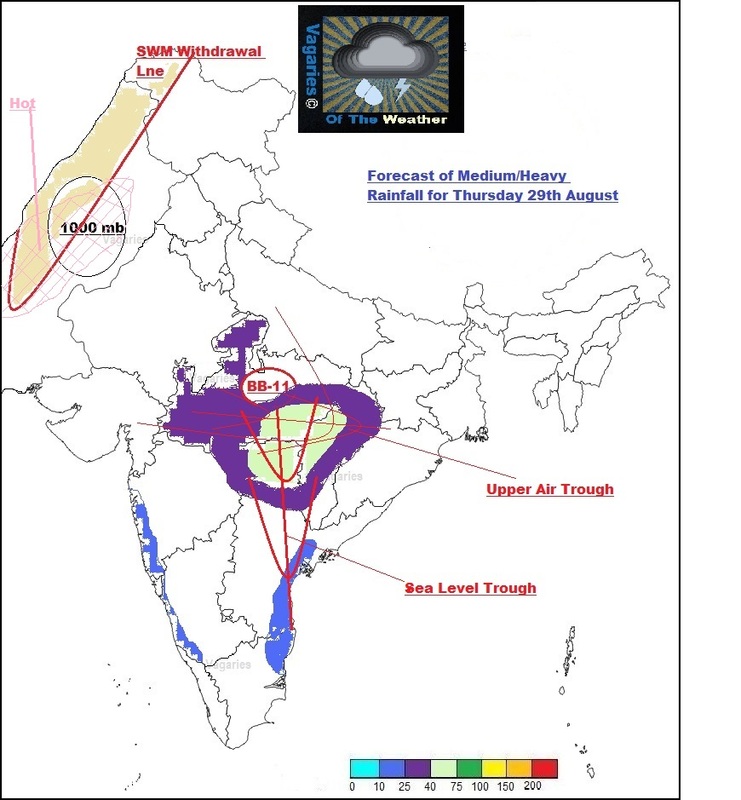 Mumbai Rains almost near our predicted range (upto 7 mms)...Colaba 18.8 mms, Scruz 7 mms...average 13 mms. .Aurangabad and Washim amongst the higher at 8 mms. Mshwar at 14 mms. Great to hear Sir..its very dry here for the past few days..hoping to get back rains..expecting a strong thunder shower late night on thursday and into early morning on Friday..
when exactly will the rain's revive on the west coast once again. ....KOLKATA: A 12km tall cloud, stretching from north to south, is waiting to burst on a city that is still soggy from last week's four-day drencher. Darkness descended on Kolkata suddenly on Monday afternoon — almost as quickly as someone had drawn a curtain. Streetlights and headlights came on at 2pm. As people wondered what was happening, lightning streaked across the city and killed at least four people, including three schoolchildren. For 45 minutes, the menacing shroud hung over Kolkata but just when the residents were bracing for a deluge, the rain petered off. But the cloud isn't gone and Tuesday is going to be wet, says the weatherman. The last time such a huge cloud formed over the city was 10 years ago, said regional meteorological director G C Debnath. Monsoon clouds often stand 8-9km tall but Monday's cloud was unusual, he said, adding, "Rarely do we witness such tall columns." Light rain/drizzles in some parts of West Chennai today afternoon..huge towers were seen.. Severe thunderstorms south of Chennai now..eagerly expecting the widely forecasted rains of tomorrow night and Friday morning.. I think Srikanths analysis is based on "decision tree" model. Seems NEM greater than average probability always tends to be less. Karthiks analysis also shows most deficient areas are southern regions (SE regions). By all means 2005 was the only year in decades when NEM set earlier and excess but all other years was more towards below normal and few times normal. Now SriLanka, Indonasia seem to be in drought conditions. Wish all Weather Vagaries readers/bloggers happy Janmasthami. Lord Krishna bless us with rains and happiness (govardhan). rajesh sir, should we expect some revival of rains on the west coast in september or it's done with this year's SW monsoon 2013. Moshin/Sam: direct revival seems difficult as 2 consecutive systems BB-10 and Bb-11 have weakened fast. And, conditions for withdrawal from Pak region is favourable. But for Mumbai, we cannot rule out heavy thunder showers, once the axis moves south wards.